- Turn right at end of exit ramp. - Turn left at stop sign on to Rte. 100 North. Drive 9/10 mile. - Turn right on to Chelsea Street. Go four blocks and cross bridge. Turn left onto Elwood Avenue. Drive one block to Milford Street and turn right. Parking lot on Milford Street behind church. - Take Harlem line Metro North train from Grand Central Terminal to Hawthorne. Walk east four blocks to church. -Follow directions below for remainder of trip. -Drive 3 blocks to Milford Street. Turn left (church is on this corner to your left) Church parking lot is off Milford St. behind church. -Make the right at the end of the ramp onto Marble Avenue and next right onto Rt. 141, Franklin Avenue. -After the Hawthorne Train station, stay straight onto Elwood Avenue, then make your 3rd left onto Milford Street. 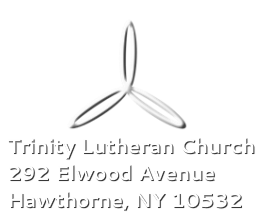 -Trinity is on the corner of Elwood and Milford, parking is behind the church off Milford Street.